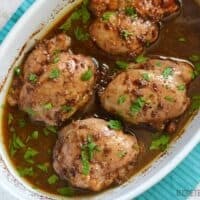 These easy Balsamic Chicken Thighs are a tasty and juicy answer to "what's for dinner?" Prepare the marinade in the morning and bake when you get home. Preheat the oven to 375 degrees. Pour the chicken and marinade into a baking dish. Place the chicken in the oven and bake for 45 minutes. Use a spoon or baster to bathe the chicken with the juices from the bottom of the dish once or twice during baking. Remove the chicken from the oven after 45 minutes and sprinkle a handful of freshly chopped parsley over top. This marinade would be enough to flavor six boneless, skinless chicken thighs, if needed.